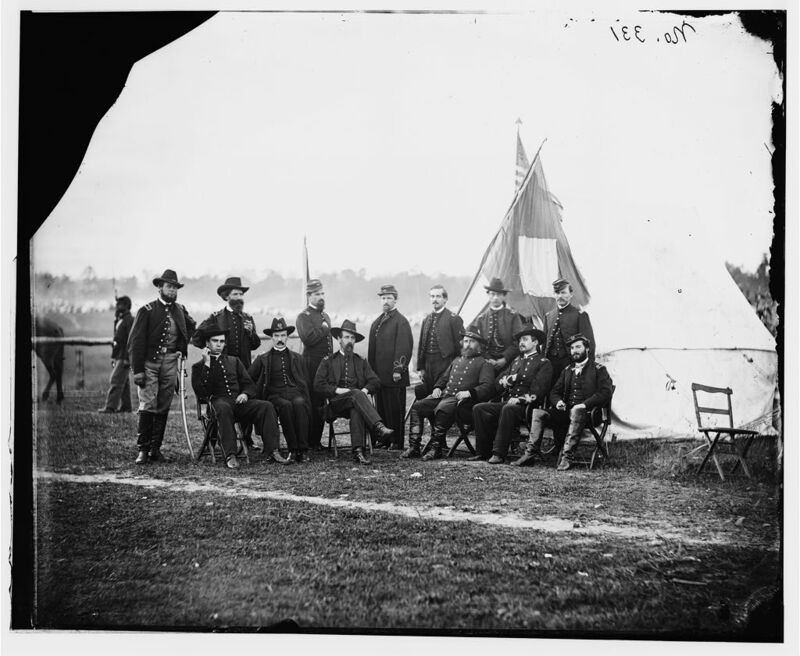 Be sure to see the Civil War images in CDV and Cabinet Card, Tintype, and Large Albumen Image formats! Miles was born in Westminster, Massachusetts, on his family’s farm. He worked in Boston and attended night school, read military history, and mastered military principles and techniques, including battle drills. Civil War: Miles was working as a crockery store clerk in Boston when the Civil War began. He entered the Union Army on September 9, 1861, as a volunteer and fought in many crucial battles. He became a lieutenant in the 22nd Massachusetts Infantry Regiment, and was commissioned lieutenant colonel of the 61st New York Infantry Regiment on May 31, 1862. He was promoted to colonel after the Battle of Antietam. Other battles he participated in include Fredericksburg, Chancellorsville, and the Appomattox Campaign. Wounded four times in battle (he was shot in the neck and abdomen at Chancellorsville), he received a brevet of brigadier general of volunteers and was awarded the Medal of Honor for gallantry, both in recognition for his actions at Chancellorsville. He was advanced to full rank on May 12, 1864, for the Battles of the Wilderness and Spotsylvania Court House, eventually becoming a major general of volunteers at age 26. Indian Wars: In July 1866, Miles was appointed a colonel in the regular army, and in March 1869 became commander of the 5th U.S. Infantry Regiment. On June 30, 1868, he married Mary Hoyt Sherman (daughter of Hoyt Sherman, a niece of William T. Sherman and John Sherman, and a granddaughter of Charles R. Sherman). Miles played a leading role in nearly all of the Army’s campaigns against the tribes of the Great Plains. In 1874-1875, he was a field commander in the force that defeated the Kiowa, Comanche, and the Southern Cheyenne along the Red River. Between 1876 and 1877, he participated in the campaign that scoured the Northern Plains after Lt. Col. George Armstrong Custer’s defeat at the Battle of Little Big Horn, forcing the Lakota and their allies onto reservations. In the winter of 1877, he drove his troops on a forced march across Montana and intercepted the Nez Perce band led by Chief Joseph that had defeated or eluded every unit sent against it over a 1,500 mile stretch from Oregon to the Canadian border. For the rest of Miles’ career, he would quarrel with General Oliver O. Howard over the credit for Joseph’s capture. In 1886, he replaced General George Crook as Army Commander against Geronimo in Arizona. Crook relied heavily on Apache scouts in his efforts to capture the Chiricahua leader. Instead, Miles relied on white troops, who eventually traveled 3,000 miles tracking Geronimo through the tortuous Sierra Madre Mountains without success. Finally, First Lieutenant Charles B. Gatewood, who had studied Apache ways, succeeded in negotiating a surrender, under the terms of which Geronimo and his followers were exiled to confinement on a Florida reservation along with all other Chiricahuas who had worked for the army, in violation of Miles’ agreement with them. Miles denied Gatewood any credit for the negotiations and had him transferred to the Dakota Territory. In 1890, the last uprising of the Sioux, known as the Ghost Dance, on the Lakota reservations brought Miles back into the field once more. His efforts to subdue them once more led to Sitting Bull’s death and the massacre of 200 Sioux, which included women and children at Wounded Knee on December 29, 1890. Miles reacted to these fights by asserting U.S. authority over the Indians, believing that all Lakota should be placed under military control. Spanish-American War and later life: In 1894, Miles commanded the troops mobilized to put down the Pullman strike riots. He was named Commanding General of the U.S. Army in 1895, a post he held during the Spanish-American War. Miles commanded forces at Cuban sites such as Siboney, and after the surrender of Santiago de Cuba by the Spanish, he personally led the invasion of Puerto Rico, landing in Guánica. Miles was a vocal critic of the army’s quartermaster for providing rancid canned meat to the troops in the field. He served as the first head of the military government established on the island, acting as both head of the army of occupation and administrator of civil affairs. He achieved the rank of Lieutenant General in 1900 based on his performance in the war. Called a “brave peacock” by President Theodore Roosevelt, Miles retired from the service in 1903 when he reached retirement age. Upon his retirement, the office of Commanding General of the U.S. Army was abolished by an Act of Congress and the Army Chief of Staff system was introduced. Under the law at that time, only one person at a time was authorized to wear and hold the rank of lieutenant general, which was then the highest rank an officer could hold. President Theodore Roosevelt, anxious to rid himself of Miles (they detested one another), swore in General Samuel B. Young as the first Army Chief of Staff on the very last day of Miles’ tenure of office. For approximately a period of an hour, the United States had (illegally) two men as lieutenant generals serving on active duty. This was remedied when Miles was notified of his retirement by way of bicycle messenger and escorted out of his office to make way for the new Army Chief of Staff. Miles served as a commander in the Civil War, the Indian Wars, and the Spanish-American War. In his late 70s, he volunteered to serve in the army during World War I as well, but was turned down by President Woodrow Wilson due to his age at that time. Perhaps fittingly, Wilson also turned down the request of one of Miles’ biggest criticsTeddy Rooseveltto serve in the European conflict. Miles died May 15, 1925 at age 85 from a heart attack while taking his grandchildren to the circus in Washington, DC. He was buried at Arlington National Cemetery in the Miles Mausoleum. It is one of only two mausoleums located within the confines of the cemetery. This page was last revised on April 21, 2019.